Japan Isn't Getting a PS Vita Price Cut Yet. It's Getting Two New PS Vita Bundles. 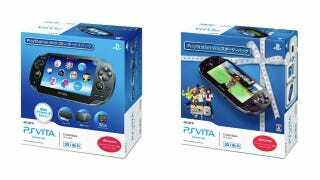 This November, two new PS Vita bundles are hitting Japan. There's a Bonus Pack which comes with a 3G/Wi-Fi PS Vita, 20 hours of pre-paid 3G data, a cradle, protective film, and a 32GB memory card, plus AR cards, etc. Then, there's a Standard Pack, which comes with a 3G/Wi-Fi PS Vita, 20 hours of pre-paid 3G data, a 4GB memory card, and Hot Shots Golf 6, plus the AR cards, etc. The Bonus Pack will be out on November 15 and is priced at ¥34,980 (US$446), while the Standard Pack will be out on November 22 and is priced at ¥29,980 ($382). This isn't a price cut per se, but I guess it'll have to do for now.